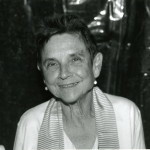 Adrienne Rich’s most recent books of poetry are Telephone Ringing in the Labyrinth:Poems 2004-2006 and The School Among the Ruins: 2000-2004. She edited Muriel Rukeyser’s Selected Poemsfor the Library of America. A Human Eye: Essays on Art in Society, appeared in April 2009. She is a recipient of the National Book Foundation’s 2006 Medal for Distinguished Contribution to American Letters among other honors. She lives in California. This entry was posted on Wednesday, September 2nd, 2009 at 5:06 pm	and is filed under Poetry. You can follow any responses to this entry through the RSS 2.0 feed.